Left Alive Gameplay Trailer Details the Paths to Salvation | Nerd Much? Square Enix has finally given us our first good look at their upcoming survival action shooter today. 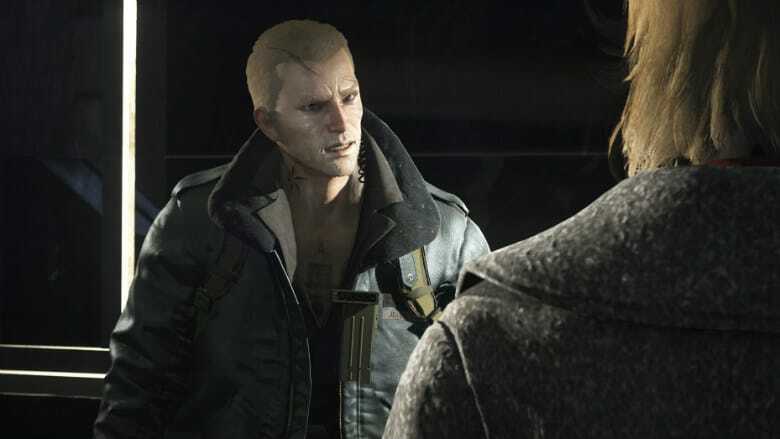 The publisher’s dropped the first Left Alive gameplay trailer, showing us the numerous ways we can make our way through the war torn Nova Slava. Today’s Left Alive gameplay trailer provides us with a solid look at the title’s three main protagonists. As we see the trio in action, we simultaneously get a feel for how the game as a whole will function. We’re also treated to some of the game’s cheesy dialogue that will surely be saturating the adventure throughout. A lot of Left Alive seems to revolve around player choice. It looks as though there will be plenty of stealth options if that’s your preferred way to advance. Or you can go guns blazing and just mow down whatever soldiers foolishly impose upon your path. Dialogue options will also pop up that will have a direct affect on the narrative. The Left Alive gameplay trailer shows us a portion of this from the game. In one instance a player steps in front a threatened bystander, saving them from execution. Another option sees that same character attempting to negotiate peacefully, resulting in the bystander being shot as they were still exposed. We also get a quick tease of the game’s mech action in the Left Alive gameplay trailer. Speaking of which, Square Enix also that there will be a Mech Edition of the game available through the Square Enix Online Store. The package is pretty steep at $159.99. It includes a VOLK Action Figure, a Hardback 80-page Artbook, a Steelbook Case, and the upcoming Survival Pack DLC. We’ll likely get to learn more in the coming months about the characters on display within the Left Alive gameplay trailer. But with the game releasing on March 5th for PC and PlayStation 4, hopefully we get that information sooner rather than later.